For Christmas 2011, no less than 3 different Moshi Monsters toys have made it into the top 10 hot Xmas toys lists, making them as popular a brand as Lego in terms of number of times different toys have been selected. Not bad for a website only started a couple of years back! The Moshi Monster Treehouse features on the top list of all, the Dream Toys 2011 list issued by the UK Toy Retailers Association, plus the Toys R Us top 20 and Play.com's top 12 Christmas toys - scroll down for further details and to compare prices. Moshi Monsters talking plush toys were selected by the most famous UK toys shop of all, Hamleys in London. if they tip it, it's going to sell! The toy tip from Toys R Us in the USA was the Moshling mini figure 3 pack, perfect for populating that Moshling treehouse! And if you haven't a clue what a Moshi Monster is, read our duffer's guide below! Give your Moshlings the perfect home with their very own treehouse. The Mini Moshlings Treehouse has special Moshling-size places amongst the leaves, so your Moshling can b kept safe and sound. 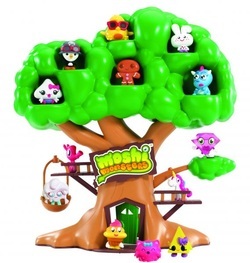 The Mini Moshlings Treehouse set also includes a free Roxy Moshling figure exclusive to this Moshling play set. (Other Moshlings sold separately.) For ages 4 years and over. Moshi Monsters is a beautifully designed website where kids can adopt their own monster and look after it. Over 26 million players have already signed up to puzzle, play, explore and chat in this virtual monster paradise. There are six monsters to choose from; Poppet, Katsuma, Luvli, Diavlo, Furi or Zommer. Children care for their adopted monster by solving puzzles and games, and earn rewards called Rox. They can then spend their Rox on items for their monster, from food to furnishings and toys for their monster's room. Over time, their monster can visit different parts of the virtual Monstro City, and children can make friends with other monster owners in a safe and carefully controlled environment. The monsters communicate through speech bubbles to encourage reading and expand vocabulary. What's more, their moods are represented by a visual icon, and and also expressed by a word in their virtual room. When the monster chages mood, children can learn new vocabulary, as their monster might be feeling 'jubilant' one day, and 'melancholy' the next. The website has been carefully designed to provide a stimulating environment, as the puzzles test their spatial, maths and logic skills. The website software also adjusts to your child's ability; if they complete puzzles quickly, they get harder, and if they are struggling, they get easier. It is free to adopt a Moshi Monster and play the basic levels of games, but membership is available that unlocks cool extras and new areas, including the popular Underground Disco! Membership is currently £4.95 per month, or 6 months for £23.95, or the best buy 12 months for £29.95. A sneak peek into the world of Moshi Monsters without the need to sign up!